Catholics Remove The 2nd Commandment! This is unbelievably! How low will the Catholics stoop in order to deceive their followers. No wonder the Bible warns us about false prophets who creep into the Church, teaching for doctrines the commandments of men (Mark 7:6-13), having their conscience seared with a hot iron (hard-hearted) and teaching doctrines of devils (1st Timothy 4:1-3). Kindly said, the Roman Catholic Church is straight from the pits of Hell. I say this kindly as a friend who cares for your soul. Oh, how I wish the one billion members of Roman Catholicism cared MORE about truth and principle, than about family and relationships. That's what has cursed Catholics, that is, family tradition. Since grandma was a devout Roman Catholic, and since uncle Joe is a Catholic, and since cousin Janet is a Catholic—that makes it next to impossible for a son or daughter to go become a born-again Christian who doesn't need religion. From the cradle-to-the-casket—the Vatican has a religious package for you! As you can see in the right column, the Catholic church has some very good reasons for getting rid of these Scriptures, which forbid bowing to Statues. Notice that even bowing is a sin!!! Where did the 2nd Command go not to bow to idols? Do you see how evil and sneaky the Vatican is? They totally removed the 2nd Commandment from the Bible forbidding BOWING to statues and idols. Instead, they've buried it in their Catholic Catechism out of sight for worshippers to see. Hence, when the Catholic Church posts their Ten Commandments, the 2nd is gone, gone, gone! No wonder they worship devils through idols! I. "MALE AND FEMALE HE CREATED THEM"
Since the Catholics eliminated the 2nd Commandment, it threw the Catechism's list out of whack in comparison to the Biblical Ten Commandments. The fact that the Vatican had to fabricate something for the 9th Commandments, clearly evidences that something is very wrong. Woe unto the Catholic Church and their false plan of salvation! Sacramental salvation is a road to Hell forever. The old man cannot be changed, educated, rehabilitated, nor reformed. You need the new birth, that is, a spiritual birth—by receiving Christ's payment for your sins. The Gospel is defined in 1st Corinthians 15:1-4 as Christ's DEATH, BURIAL and RESURRECTION. If you receive the Gospel as payment for YOUR SINS, then you are saved. Here the Vatican makes up their own commandment to compensate for the missing 2nd Commandment. I don't recall anything in the Ten Commandments about having a pure heart! Certainly, God wants a pure heart, but that's not one of God's Ten Commandments! First of all, not bowing to a graven image is the 2nd command, not the first. The evil men who wrote the preceding Catholic Catechism deceitfully split the 10th commandment into two to make up for the missing 2nd commandment. Why are there two commandments telling us not to covet? It seems mighty strange don't you think? It's obvious what the Devil has done here. You can't just eliminate the 2nd Commandment! Secondly, the quoted passage I have given you from the Catholic Catechism is blasphemy. God clearly warns us in Exodus 20:4-5 NOT to make unto ourselves ANY graven images. Catholics attempt to justify their idolatry by comparing what they do to the brazen serpent in the Wilderness in Moses' time. The children of Israel had murmured (complained) so much that God decided to judge them with fiery serpents. 16,000 Israelites had already died and Moses pleaded with the Lord to spare Israel. God told Moses to fabricate a serpent made of brass, to hold it up before the Jews, and tell them to look unto the serpent to live. That serpent symbolized Jesus Christ, Who became as sin to save us. This is why we read in John 3:14-15, "And as Moses lifted up the serpent in the wilderness, even so must the Son of man be lifted up: That whosoever believeth in him should not perish, but have eternal life." Carefully notice that the brazen serpent was God's idea, not Moses. God never told us ANYWHERE in the Word of God to make a statue of anyone nor anything. The Israelites were instructed to “look” to the serpent (which pictured Christ) so they could live. The people were NOT instructed to bow, honor, nor pray to the brazen serpent (statue). It is sinful for Catholics to attempt to justify their idolatry by taking the incident of the brazen serpent out of context. The entire focus of the brazen serpent is to LOOK TO JESUS TO LIVE. Isaiah 45:22, " Look unto me, and be ye saved, all the ends of the earth: for I am God, and there is none else." It is a sin to look to Mary. The Catholics can devilishly call their idolatry "Respectful Veneration" if they want to, but it's a direct violation of the 2nd Commandment (which they don't have in Catholicism). Anything can be justified if one is willing to twist the truth far enough. The FACT of the matter is that neither Jesus, nor any of the Apostles, elevated Mary in any capacity. Yet Catholics have created a monstrosity of adoration toward Mary, refusing to obey the Scriptures. Jesus Christ is magnified in the Word of God, not Mary. A standard Rosary contains 53 Hail Marys. It is sinful idolatry. The next time you go to Mass, watch the priest when he prays and you will see that every single word he speaks is read from a piece of paper. There is no heartfelt sincerity or communication with God. It is all formalized religion, preplanned and prewritten, and God is not worshipped from men's hearts as He should be. Matthew 15:7,8, "Ye hypocrites, well did Esaias prophesy of you, saying, This people draweth nigh unto me with their mouth, and honoureth me with their lips; but their heart is far from me." Prayer should NEVER be read from a piece of paper, which is really not prayer at all. Catholics recite the SAME dead words over and over and over. I believe most Catholic people are sincere—hearing the pretty music and bells, seeing the beauty of religion and a magnificent worship building, hearing about Jesus' death and resurrection—but what they fail to realize is that Catholicism officially teaches that a person MUST do good works, get water baptized, go to Mass, keep all the Seven Sacraments, and become a member of the Catholic Church in order to get to Heaven. The Word of God teaches you just need to acknowledge your guilt of sin and believe on the Lord Jesus Christ to be forgiven. There is NO religion involved, which is very difficult for some people to grasp, because they were brought up in a religious family. The only work which we must do to be saved is to believe on Christ, John 6:29, “Jesus answered and said unto them, This is the work of God, that ye believe on him whom he hath sent.” Salvation is not found in ANY religion; but in a Person—the Lord Jesus Christ! Note: The teaching not to bow to statues is found BURIED in the Catholic Catechism, but it's avoided like the Black Plague, and is not mentioned when priests or Catholic speakers recite the Ten Commandments. It is avoided for good reason—because it is an indictment against their idolatry! Catholics DO bow to all manner of statues. If you ask any Catholic to quote the Ten Commandments to you, they'll never mention anything about not bowing to statues or idols (because that's the heart of their religious). They bow to Mary. 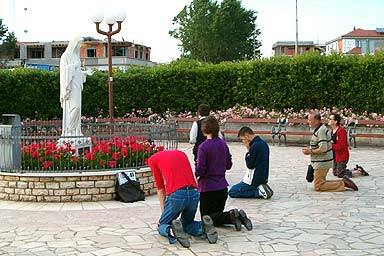 They bow to Our Lady Of Fatima. They bow to idols of patron saints at home. Pope John Paul II - Burning in Hell | The Catholic Church is a Big Hoax! The Lie of Roman Catholicism | The Great Whore | Praying to Mary | Roman Catholicism Exposed! Does Anyone Care What The Lord Has To Say About Religion? “He answered and said unto them, Well hath Esaias prophesied of you hypocrites, as it is written, This people honoureth me with their lips, but their heart is far from me. Howbeit in vain do they worship me, teaching for doctrines the commandments of men.